Predicting the future is difficult, but that doesn't keep people from trying. Get it right, and the rewards can be significant. One way to improve your odds is to spread your risks. Another is to think hard about the dynamics of the market, which has multiple levels of related activity. By placing bets of varying sizes at various levels, your odds of success climb. What do I mean when I talk about "levels"? One of the most informative graphics about these levels comes from Stuart Brand and Paul Saffo and their work on the Clock of the Long Now (the book from 2000 remains a classic, in my opinion). 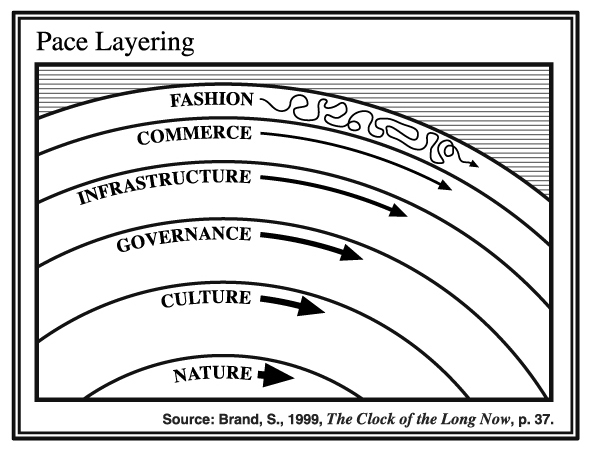 In this layered model, fashion is a superficial, fast-moving layer, while commerce regulates fashion as a moderating layer, which itself is regulated by infrastructure. The layers continue through governance and culture, each of which moderates and regulates the levels above it, until we hit the ultimate rate-limiter, nature itself. These layers translate fairly directly into business, with investments at the fast-moving levels being more cash-intensive and more prone to failure, while the deeper you go -- into commerce, infrastructure, and down to nature (commodities and real property) -- tends toward stability. Of course, ask anybody in the petroleum or housing markets, and they'll not feel that even the more fundamental layers are behaving predictably these days. Nevertheless, odds are odds, so playing them well can pay off. Warren Buffett is a classic example of enduring success, and his approach fits this narrative. Buffet spreads his risk, and tends to look for investments at deeper levels than the fashionable, generally avoiding the glitz and glamour. He likes to find infrastructure or commerce that binds many fashionable trends, or is itself immune to the vicissitudes of trendiness. Take, for instance, Buffett's investments during the dot-com bubble of the late-1990s. While investors were chasing IPOs and stocks with artificially inflated valuations from Silicon Valley, Buffett was looking at the infrastructure level supporting the Internet -- namely, energy. With more computers, more servers, and more cell phones, demand for electricity was destined to surge. Buffet bought energy companies instead of tech stocks, and had the last laugh when the bubble burst. To Buffett, the significance of Silicon Valley at the time wasn't Pets.com or Pointcast -- it was that a lot of new demands on the electrical grid were emerging, making investments in energy smart. Sometimes, it seems as if purveyors of the latest fad try to make it look like it comes from a deeper level of experience. For example, one hallmark of many flash-and-crash dot-coms (and it still holds true to some extent today) is that they revolve around "a big idea" -- that all commerce will move online, or that all data will matter, or that people will value connection over commerce. This helps these ideas masquerade as being more important than they really are. While that may attract investors, it also increases the likelihood for failure. Not everything is fundamental. Most things are ancillary. Identifying what kind of work you're doing in building your business helps to prevent misadventures, as well. In a fascinating piece covering the failed alliance of Facebook CEO Mark Zuckerberg and New Jersey politicians Chris Christie and Cory Booker to rescue Newark's schools, NPR's "Fresh Air" discussed how Zuckerberg learned that it wasn't "the big idea" that would make the difference, but using experts, activating infrastructure, and engaging stakeholders, which led him to a more modest, local approach in his own backyard, and one that is apparently working. The problem failed when framed as an infrastructure upgrade. It worked when recast as emanating from the governance level. As I wrote recently, mistaking the superficial changes for fundamental changes in a market can lead to poor decisions. Root causes and fundamental market forces are important to appreciate, understand, and address. Spreading risk into deeper layers girding the more obvious changes may be an approach to consider in seeking growth and sustainability.